Terri Chiao and Adam Frezza used footage taken during daytime meditations in and around the pavilion to project onto the walls of the structure at night. 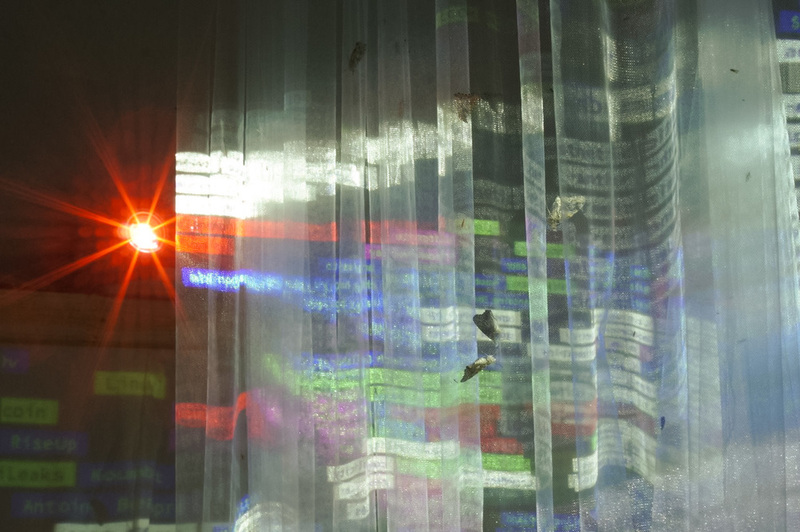 The footage draws attention to natural sunlight “projections” through the forest canopy. Brian House set up a four-channel sound system projecting out from the structure and into the surrounding territory. He sent pulses into each speaker whose rate was determined by the angle above the horizon of four celestial bodies (sun, moon, uranus, saturn). The pitches of the pulses were generated via an algorithm mimicking Arvo Pärt’s tintinnabuli method of voice layering. Finally, the timbre and texture of the sound came from him as he meditated while maintaining a note on a melodica for the duration of the piece. 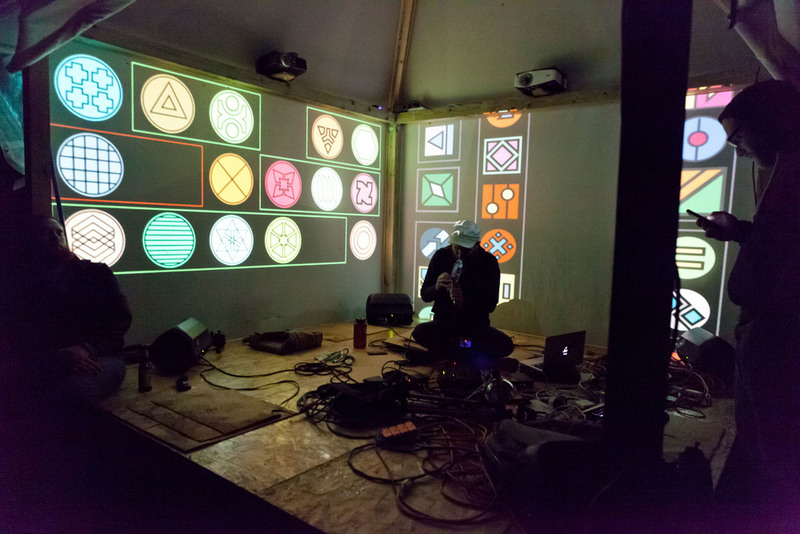 In the resulting performance, his breathing and the transit of celestial spheres were implicated in the landscape as the audience wandered nearby. Here to Listen. Jonathan Sims created digital images to accompany the performance (animated with the technical assistance of Gene Kogan). Jonathan exhibited a new crop of asemic glyphs and linear scripts arrayed with new and abstract imagery. 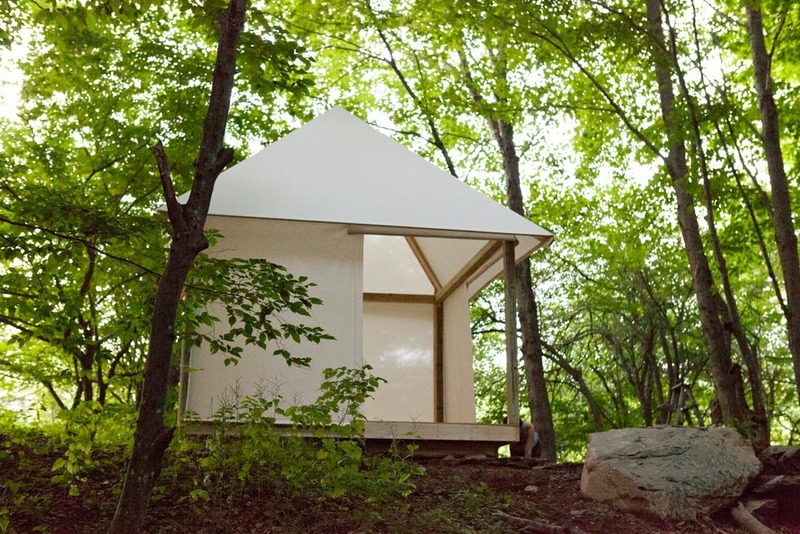 In the summer of 2014, Delta_Ark and Biome Arts co-organized a large scale collaborative project: a two-week symposium on ecology, technology and autonomy that culminated in the construction of a networked, semi-autonomous structure in the woods of Delhi, New York. This structure served as a performance space, international activist meeting hall, gallery and platform for other artworks. Eleven artists participated, Sally Bozzuto, David Kim, Chihao Yo, Adam Frezza, Terri Chiao, Gene Kogan, Jonathan Sims, Brian House, Isabelle Fortier, and Anne Goldenberg. The artists gathered for two weeks to do collective research and mapping of both (a.) the solarpunk science fiction movement, a movement that renders a utopian future with local ecological control, cooperative ownership and decentralized governance and (b.) the solidarity economy, a political and economic movement that seeks to actualize these ends. Situated within Forest Pavilion is Delta_Ark's collaborative installation with Biome Arts, The Core. The Core was a conversation machine that was also simultaneously an interspecies feedback loop and space for discourse. The digital component of Core is an interactive mind-map editable by anyone in the world with internet access 50.18.115.212/iameetinghouse. Also accessible within The Core via four computer terminals, the mind-map evolves as participants discuss, rearrange, and add new topics along an axial coordinate system. 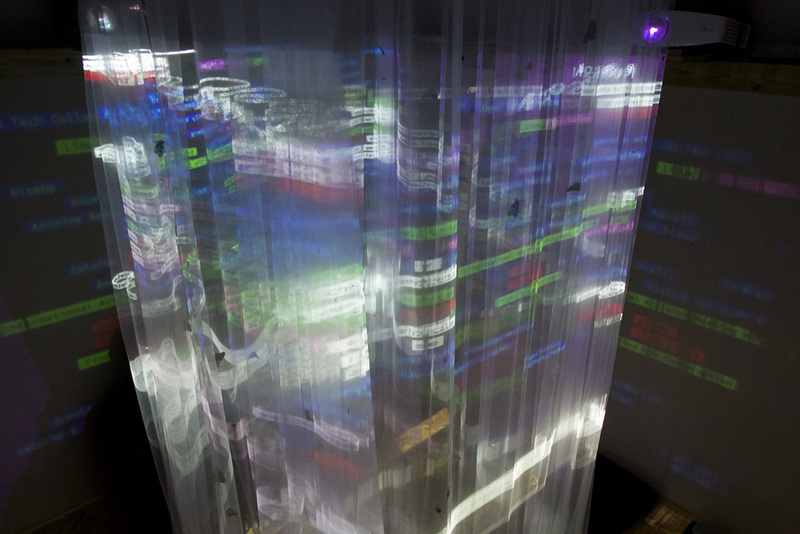 The mind-map was also projected on to a multi-layered column of sheer fabric at the center of The Core. The biological elements of The Core include cultivated Vanessa cardui butterflies. These insects are drawn to light of the projected mind-map, shifting the attention of participants and thus the flow of conversation.